River Mountain Farm is horse and rider friendly, with plenty of land to hack and condition outside the arenas. There are cross country jumps and hills for fitness training. On the 400 acres located just minutes from the airport and 20 minutes to the Horse Park, there is a 2 1/2 mile conditioning track. The Main Barn is a center aisle barn with 22 matted stalls There are 2 wash stalls with warm water, 5 grooming stalls, 3 tack rooms, a laundry room, and 16 private tack lockers. The barn is attached to the indoor with a heated lounge and viewing area. The Layover Barn has ten matted stalls, and private turnout. The Show Barn has 12 stalls all with mats, great ventilation, a wash stall and feed/tack room. The Broodmare Barn has 12 stalls including 2 foaling stalls, vet office, wash stall, and private foal paddocks. The Indoor Arena is 200 x 80 with a polytrack footing and an overhead watering system. It is also well ventilated with huge windows to let in plenty of natural light and fresh air, in addition to the great artificial lighting and music system. There are 3 Outdoor Arenas with all weather footing that is maintained daily. 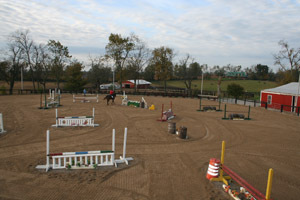 A 200x200 arena with jumps, lights and a watering system, a dressage arena and a schooling arena. The 120' diameter Kraft Eurocisor can walk or trot up to eight horses at a time on all weather sand based footing. Two Round pens (50' and 65') for training the young horses are available. The Polo Pony 2 1/2 mile track is great for conditioning or a hack out of the ring. There are natural Cross Country jumps located in our back field. We also have some hilly terrain to improve fitness and strength.